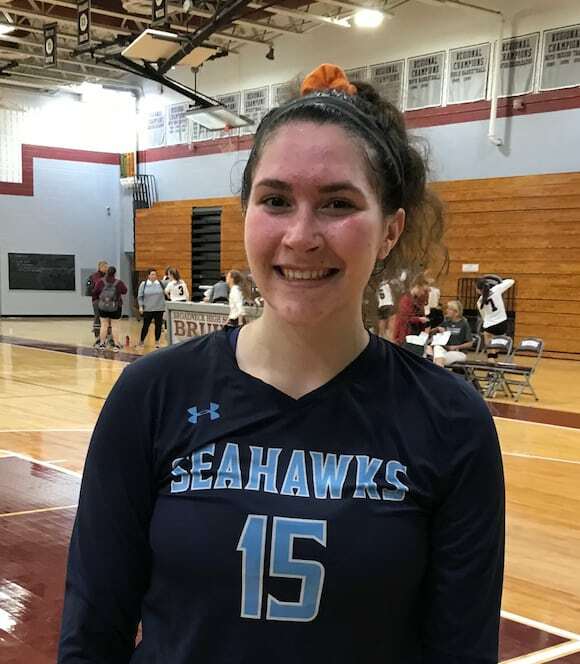 Samantha Tarabella is all smiles after her 17-kill performance in South River’s three game volleyball sweep over Anne Arundel County rival Broadneck. If Anne Arundel County had a dictionary of volleyball positions and you went to the term “hitte” – you might find the photo of South River’s four-year varsity player Samanta Tarabella next to it. Those balls that zoom over the net for points are called kills and the strong 6-foot Tarabella usually gets more than her share and she delivers more than kills. 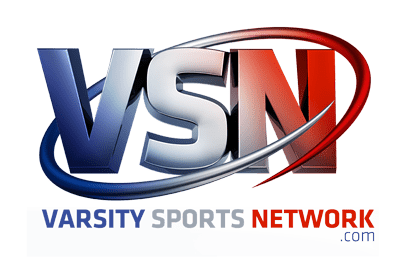 Tarabella delivers bullets, lasers and simply wicked knock-you-out points and she pounded Broadneck for 17 kills Tuesday night in Cape St. Claire to pace VSN’s No. 2 South River to a three-game sweep of No. 9 Broadneck by scores of 25-17, 25-20 and 25-18. Tarabella pulverized the game ball throughout the match and it’s a wonder the ball had any air left in it at the end as the visiting Seahawks improved their record to 2-0 while the host and much improved (7-7 in 2017) Bruins are 0-1. It’s early but it’s going to be interesting to see if Tarabella can keep it up through the course of the season as the Hawks look to live up to their preseason favorite status in Anne Arundel and likely beyond. Tarabella sure fired up her teammates at Broadneck as the Seahawks closed out the first game with a 7-1 run, scoring the last five points in succession. Tarabella posted six kills in the first set before cooling off in the second game with three kills. Fellow seniors Savannah Doctor (6 kills) and Erin Canter (10 kills) picked Tarabella up with three kills each as South River prevailed with a five-point victory after trailing most of the way. The Bruins had also had a pair of three-killers in game two as junior hitters Emma Quandt and Brianna DeMouy put the home team within 15-18 before the Seahawks would pull away with a 10-2 run. Tarabella finished things off the 25th point on a smasheroo that threatened to knock out a Bruin or two. Her decisive kill carried over to the match clincher as she pumped in right more kills. Broadneck played even better in the third game battling the Seahawks as the teams rung up 14 ties, the last at 17 before the visitors tallied eight of the last nine points for their 25-18 victory. The play of setter Emily Speciale (16-for-16 with one ace, 18 assists) and junior Danielle McKnight (17-for-18, two aces) at the service line was also instrumental in the South River triumph. Under Carter the Seahawks are perennial contenders in their county and region, but have never won a State crown. South River, a rather snakebitten program when you get down to it, has been to in the coach’s words “a zillion region finals,” but only one final four. Maybe that Tarabella girl “can kill it” this time.